Usually, when you have a video file on your iPad or iPhone, the file can play on that device—why else would it be there? But occasionally you’ll run into a need to convert a video file, like I did recently, and when that happens CloudConvert gets it done right on the same device, no computer necessary. CloudConvert can handle more than just video files, but that’s where my story begins. I recently set up a Motorola Focuss66 wireless camera in my kids’ playroom. They spend a lot of time in this room where imaginations run amok, laughter is contagious, and inevitably fighting erupts. The psuedo-brawls always seems to erupt shortly after my wife or I walk out of the room, leaving us to decipher the crying and bruises to figure out exactly what happened. CloudConvert can grab files from your Camera Roll, iCloud Drive, Dropbox, and Google Drive. I knew with the camera setup and the Hubble app installed on my iPhone and iPad, it was only a matter of time before I would find myself browsing video clips. A few days later, as the tears streamed down the face of my youngest son, I launched the app and found the clip of when the incident occurred. Sure enough, the story I was getting was nowhere close to matching what I watched unfold on my iPhone. His older brother had indeed hit him. I beamed with pride, feeling like CSI had nothing on me at that very moment. Then came time to share the video file with my wife over iMessage, only to find the Hubble app doesn’t allow for iMessage sharing, only email. You get tons of options to convert each file, with advanced options for tweaking compression levels. Not a big deal, I thought. I tapped the Mail icon, where I then found a link to download an FLV file. In other words, it was impossible to share the clip in its current form on iOS. I felt defeated. I downloaded the file anyway using Workflow, and hoped to find a conversion workflow in the gallery or on Twitter. But once I had the file saved to iCloud Drive, I was stuck. I had the file, but no clue how to convert it on my iPad. Then, in what I believe was an act of divine intervention, I launched the Product Hunt app and was greeted by CloudConvert as the top listing. 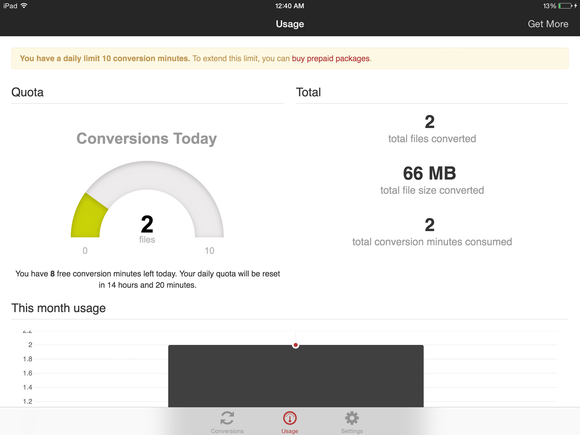 A few seconds later I downloaded the free iOS app, created an account, uploaded the file from iCloud Drive to CloudConvert, and selected the file format I wanted on the other side of the conversion. I watched as the progress bar sped through the process, delivering an iOS-friendly MP4 file for me to save to my Camera Roll. CloudConvert itself is capable of much more than converting video files. Its website claims the service supports 205 file types ranging from PDF to DOC, DMG, ISO, and ZIP, plus an even longer list of audio and video formats. Additionally you can merge or archive files directly in the app. Conversions happen quickly, and then you can save the new file. A free CloudConvert account does come with some limitations, of course. You’re limited to either 10 or 25 conversion minutes per day—each file takes a varying amount of time to convert, with the minimum amount being one minute. For reference, the 3MB FLV file I uploaded only used one minute of my allotted time for the day. Unless I start downloading large documents, I don’t see myself ever having to pay out of pocket for CloudConvert’s service (plans start at $10 for 500 minutes). I doubt I'll exhaust the free allotment anytime soon. Converting files without needing to transfer the file to my Mac and then back again has made me more aware than ever of the power of iOS—and the file limitations. I had no idea something like this was even possible on any of my iDevices. The ability to convert files is something I’ve long put in the column of reasons why I can’t fully quit my MacBook, yet here I am switching it to the win column for iPad-only computing. This discovery, nearly eight months after the app launched, leaves me wondering what other apps and services I’m yet to discover. Got any suggestions?